Local search engine application is most selling directory platforms, with premium design and exclusive coding style our Justdial Clone Android App serves best ever local business directory solution for all kind of directory models. Since making a niche directory like yellow pages, Justdial, lead generation, and a local guide are simple in these decades. By the way, we are here to fuel your dreams, a perfect app builder crew at PHP scripts mall and is the dead end solution android business marketplace. Are you beholding to venture Business Directory App via Android platform? Here you can find a successful solution to your business requirements. The user can get featured rich directory as well as through tailor utilize this app for business listings, classifieds, event locater, dining guides, lead generation platform and more. Once get into the application you will route to profile, rating, home, and log out options. By clicking certain business listing you can view the business name, image, overall ratings, phone number, address etc. and click read more button reveals full details of that product. If the user wishes to make a call to that shop or anything, the user needs to click “make a phone call” button, wherein case user feels to make any demand to the merchant easily a member can send an inquiry about the shop or anything by clicking “Send Enquiry” button. In detail page read out profile, portfolio, event, blogs. The user might post ratings to the product and services that he/she deserves. Local Search Engine Android Application is well optimized database download and tweak to launch a business in a minute. Admin dashboard prevails in user management, membership package, category access, location set, post ad with the title, comment, status, and action option, featured ad listing, career detail, testimonial etc. Android business directory app, general features includes site title, keywords, PayPal mail id, CMS page, image slider, etc. 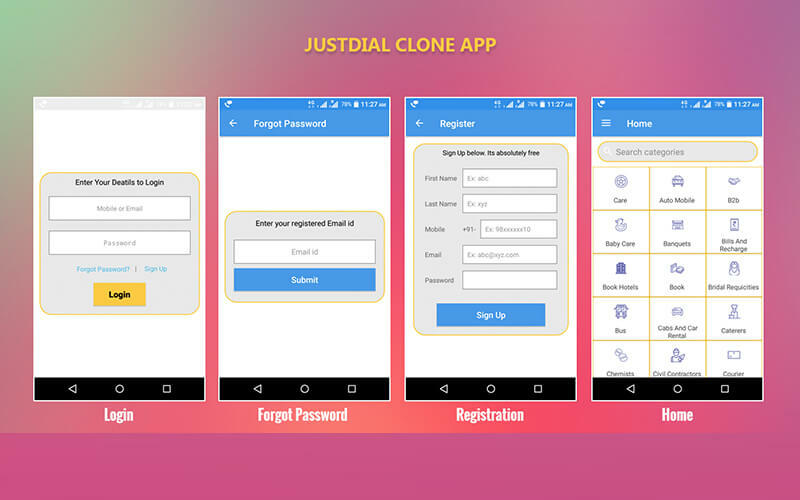 Our Justdial Clone App package includes Android Java source code, web admin board (PHP & MySQL), database file, documentation etc. Also we notify that local business listing app will only run along-side our web based Justdial Clone Script, such a way that we have developed this app will connect with our script readily. Our app comes with features like attractive user interface, optimized code, better performance etc.